Fifty-three million people, or 44% of internet users and one-quarter of all adults, now say they use online banking. Those figures amount to an increase of 47% over the number of Americans who were performing online banking in late 2002. On a typical day online, 13 million Americans are performing banking chores online, a 58% jump from late 2002. These latest results come from a survey done by the Pew Internet & American Life Project in late November 2004. Of all the major internet activities tracked by the Project since its inaugural survey in March 2000, online banking has grown the fastest. Broadband and online experience. The spread of online banking has coincided with the spread of high-speed broadband connections and the increasing maturation of the internet population. Fully 63% of those with broadband at home have tried online banking, compared with 32% of those with dial-up connections. And 51% of those who have more than six years of internet experience have tried banking online, compared to 27% of those with three years or less of online experience. The rise of GenX. Those with internet connections between the ages of 28 and 39 to have tried online banking. 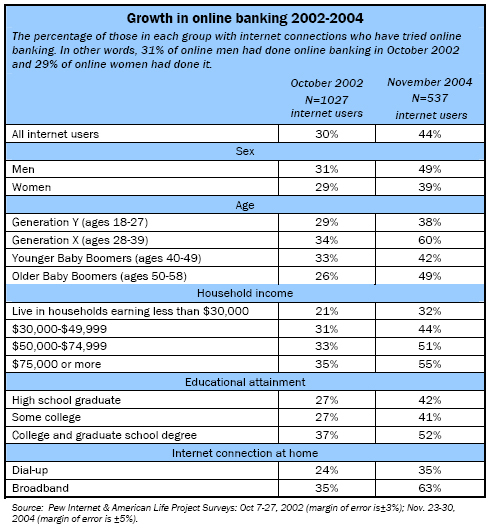 Some 60% have done so, compared to 38% of wired GenY members (those 18-27) and 25% of those with internet connections over the age of 60. Men. In the past two years, online men are notably more likely to perform online banking activities than online women. Half of men with internet connections (49%) have tried online banking, compared to 39% of online women. This is a change from the situation two years ago when internet-connected men and women were equally as likely to be banking online. Higher socio-economic status. Online banking, like many other internet activities, is most likely to be performed by those living in well-off households (households with more than $75,000 in income), those who have college and graduate degrees, and those who live in suburbs. It is important to note, though, that there has been an across-the-board increase in online banking that has brought more of those who are working class, those who don’t have college degrees, and those in rural areas into the online banking population. This rise in online banking likely flows from two major trends. The first is that as internet users gain more experience online, they are more likely to perform activities that involve money, such as making online purchases and travel reservations, and participating in online auctions. The second trend is that banks themselves have discovered the virtues of online banking and have become more aggressive in offering it as an option to customers. Various studies have found that online banking customers are more profitable than offline customers – they make fewer customer service calls and are less likely to switch banks. That means many banks are improving their online services and offering them free of charge to customers. Of course, phishing (the practice of trying fraudulently to get consumer banking and credit card information) is one potential new problem for online banking. Increasing numbers of fake emails are showing up in people email inboxes, “warning” them that their account information needs to be checked or that some problem has arisen in their account. These emails then point people to Web sites where they are asked to enter their financial information. This fraud not only costs banks real dollars, but it degrades customers’ trust in the bank and in online banking in general. The findings here come from a national telephone survey of 537 internet users conducted between November 23 and 30, 2004. The survey has a margin of error of plus or minus five percentage points. The Pew Internet & American Life Project is a non-profit initiative of the Pew Research Center and is funded by the Pew Charitable Trusts to examine the social impact of the internet. The Project does not advocate any policy outcomes. It is non-partisan.